SAN ANTONIO, TX -- In the old days the Canyon Springs Golf Club was the site of the last stagecoach out of town. Today it's a gateway to a memorable round of golf -- a round that will test every skill you have. Rugged-forced carries are everywhere, with native limestone and two-foot tall grass that will grab any kind of non-fairway projectile. Even if you find your ball in this jail, you probably won't be able to advance it. Take an unplayable lie and move on to the next stern check of target placement. Thankfully, they gave you five sets of tees to soften the test. Canyon Springs Golf Club, a 7,077-yard par-72, with Bermuda Tiff 419 fairways and Flora Dwarf greens, was designed by Thomas Walker, a protégé of Gary Player. 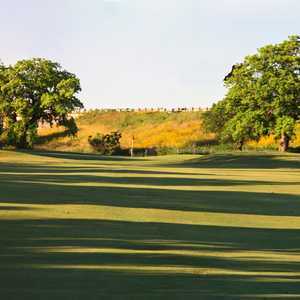 And it wants to make history of its own -- as one of the best golf courses in the Hill Country. The loop design makes it possible to play without ever seeing a parallel hole. The property certainly is historic. A saber-toothed tiger's remains were found in an underground cave just minutes away. Since the mid-1800s only two families lived, ranched and farmed here. The old ranch headquarters and the new Canyon Springs Club Haus are located on what once was the 55,000-acre J.W. Classan Ranch. And three generations of the Ackerman family homesteaded here. Limestone-rock fences are still found throughout the property and some of that rock was used to build the Hill Country ranch house-styled clubhouse. Gary Player was so impressed when he visited he asked for the plans to build an exact replica in South Africa as a residence. Just about every piece of history found on the property was incorporated into the design -- from old barn wood used as doors on the cart barn, to finished counter-top wood found in the old homestead, now used in the pro shop. An old rock well is used as an aiming point on the blind No. 2 tee shot, a 520-yard par-5. Dean Beman wanted this land for a TPC course. But it is ClubCorp, owners of famed Barton Creek in Austin, the world's largest owner and operator of golf courses, private clubs and resorts, that now holds Canyon Springs' future in its hands. "We want to be bigger and better than Barton Creek," said John Lewis, head golf pro. 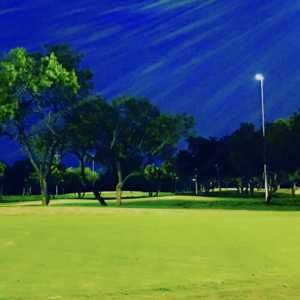 A second golf course is planned, but the land has not been secured. There will be a new hotel built, just behind the No. 1 tee box, on a bluff overlooking the scenic Hill Country terrain. That bluff is where Canyon Springs' trademark manmade waterfall cascades down into the creek, just behind the 18th green. "A lot of people can't believe that this golf course was actually constructed in 141 days," Lewis said. "We opened in 1998, but the natural surroundings weren't disturbed that much. Since it was part of an old rock quarry, a lot of the rock piles that were left behind were just covered over as part of the mounding." One piece of history San Antonio physician Gary McWilliams noticed was a small family graveyard with a tombstone, located just a slice away from the driving range. "If you play well, this is an interesting part of the landscape; if you play poorly, you check it to be sure it doesn't have your name on it," McWilliams said. "It's easy to see how this area could have been a favorite gathering place for Indians and then settlers of early San Antonio. Fairways are generous -- just don't miss 'em," he said. Water comes into play on only one hole, the par-4, 388-yard No. 16. The wet stuff is all down the left side and fronts a narrow green, also guarded by three traps. But don't think lack of water makes this course easier. There are a total of 14 significant forced carries from the tees. If you top it or just hit a weak one, you are dead. The sixth hole is one almost everyone will remember. It's a par-4, 375-yarder with a forced-carry drive, but there are two distinct fairways. You have to choose, depending on the pin placement. Do you want to approach the large hour-glass shaped green from the left or right? In the middle is no-man's land, rocks and tall grass, and several trees are strategically placed in the middle, about 75 yards in front of the green, which is only 20 yards deep, but 57 yards wide. As you drive to No.10 you are at the highest point on the property and pass the water-circulation point of the trademark waterfalls. The view here is spectacular and is a forerunner to the tee shot you are about to hit. It's a par-5, 535 yards, straight downhill, requiring a significant carry over trees and a brushy area. No. 11, a 404-yard par-4, has a punishing waste area running 150 yards down the right side. The tee shot from the par-3, 212-yard 17th is very intimidating, especially if the wind is blowing hard. There's trouble everywhere -- left is O.B. and hit it right and you can be in sand or century-old live oaks. Awards and Honors: Nominated by Golf Digest and Golf Magazine as: "America's Best New Public Golf Course in 1998." Host of the Senior PGA Tour Qualifying School. Directions: Take Highway 281 north past 1604. Turn left on Evans Road and then right on Canyon Golf Road. Where to Eat: The Canyon Springs Bar & Grille serves hamburgers, club sandwiches and other moderately priced food. Great Mexican food is nearby at the Alamo Cafe at Highway 281 and Bitters Road. The freshly made tortillas are as good as it gets. Played there 2 Oct and it was very enjoyable. People at the front desk are very obliging the price is right and the golf course is excellent. The starter set me up with 2 others to play with and I thoroughly recommend the experience.